With so many stores (about 460 to be more exact) you could spend days just shopping. The Magnificent Mile packs luxury boutiques, department stores and multi-story mega malls all into one eight-block stretch. And that’s not including the nearly 300 restaurants and 60 hotels that also make up this cosmopolitan downtown center. Beyond the glossy retail facades, however, lay incredible art and architecture, history, culture and magnificent homes. 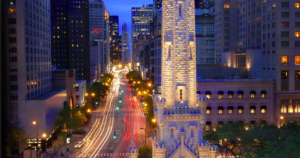 Many of Chicago’s most desired properties are located just off the Magnificent Mile including the Park Tower, The Trump Building, The Palmolive, The Water Tower, Olympia Center and the Bloomingdales Residences. Make sure to look both up and down as you meander the Magnificent Mile on Michigan Avenue between Oak Street and the Chicago River. Incredible bridges and a riverwalk right below street level offer unique views. And iconic buildings soar above including the Wrigley Building and Tribune Tower which anchor the south end and the John Hancock Center (Chicago’s fourth tallest building) to the north. The neighborhood’s most famous monuments, the Historic Water Tower and Pumping Station, are among the oldest structures in Chicago and stand as symbolic reminders of the city’s rebirth after the Great Chicago Fire of 1871. A day of shopping becomes a night of revelry on the neighborhood’s fabled Rush Street. Amongst the prestigious hotels and celebrated eateries, you will find a trove of booming nightlife hot spots and high-energy events.